You can download your game immediately after your order has been processed. Please note that nothing is sent by post. All our products are PDF format documents to print. The sacred book belonging to the animals of Alunira was stolen from the Lions' village by one of the animal tribes that live in the Alunira jungle. 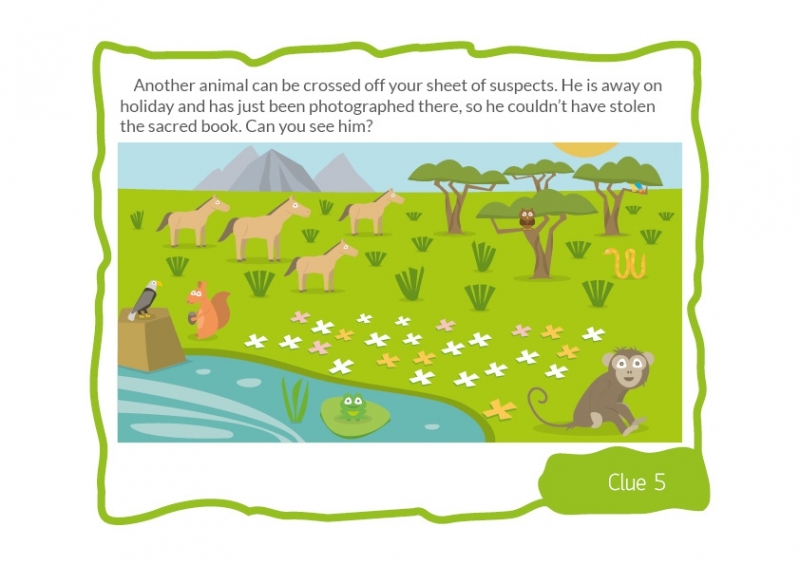 The Lion chief Matamou needs the children's help, but will they be able to solve the riddles and clues, complete the challenges and recover the book? As a reward for their help, at the end of the adventure, the Lion Matamou offers the children a share of the animals’ treasure. So you will need to prepare a decorated box with, for example, small packets of sweets inside. Hello everyone! My name's Matamou and I am the leader of the Alunira Lions. In the kingdom of Alunira, the Lions are responsible for protecting the animals' sacred book. I cannot reveal all the secrets contained in the book, but I can tell you that last night, someone stole it from us! Without this book, the Kingdom of Alunira is in great danger. We need you to help us find it. We think it has been hidden in one of the animal villages in our jungle. As you make your way through the jungle of Alunira you will come across three clues. With these clues you will be able to guess in which village the book can be found. The game can be played indoors or outdoors (garden, house, apartment...). It's up to you to decide where to hide the clues depending on where the detective mystery is being held. The game begins by reading the introduction to the children. 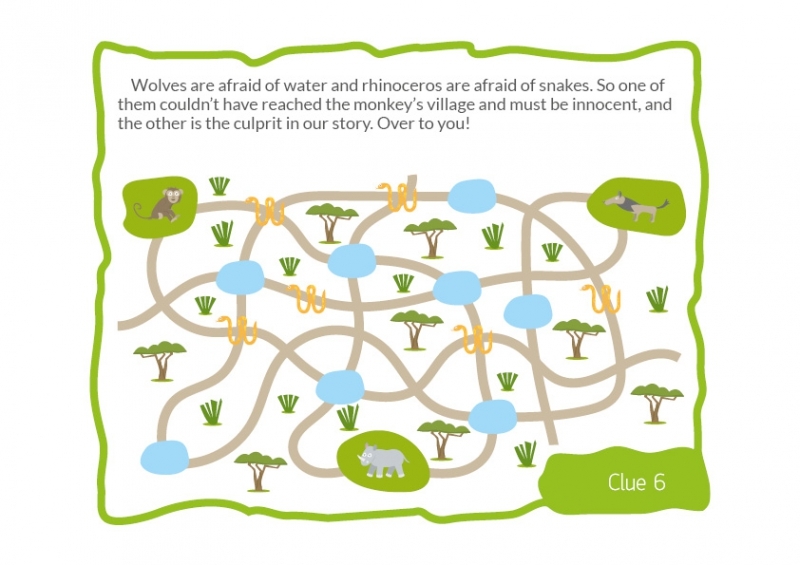 From clue to clue, hiding place to hiding place, the children have to solve all the puzzles to solve the mystery. You want to use up a bit more of the children's energy, test their memory skills, see how discreet they can be? A series of (optional) challenges are provided which can be played in between certain clues and make the game even more fun! Number of players: can be played by two teams, unlimited number of players. To be printed before starting the game: clues, initial history, organization sheets, certificates. In the "Advice" section of our website, you will find all the information, tips and ideas you need to organize this ready-to-print game successfully. You can download the game immediately after payment. You will receive an email explaining all the details. Please note that nothing is sent by post. All our games are documents in PDF format to print at home. - Lydia: "The children loved the game and I think it is well suited for children of this age group." - Sophie: "The kids definitely enjoyed the game. It's a cute story which hangs together well and works equally for boys and for girls. I love the illustrations and the story is well constructed. At the end they were delighted to go home with their diploma. Final result - one very successful birthday party!" - Karen: "The game is complete, varied and just right. The kids had an amazing time - so I'll soon be back for more!" - Sarah: "They loved it. A fun game. " - Elizabeth: "The treasure hunt worked really well for my children's party".